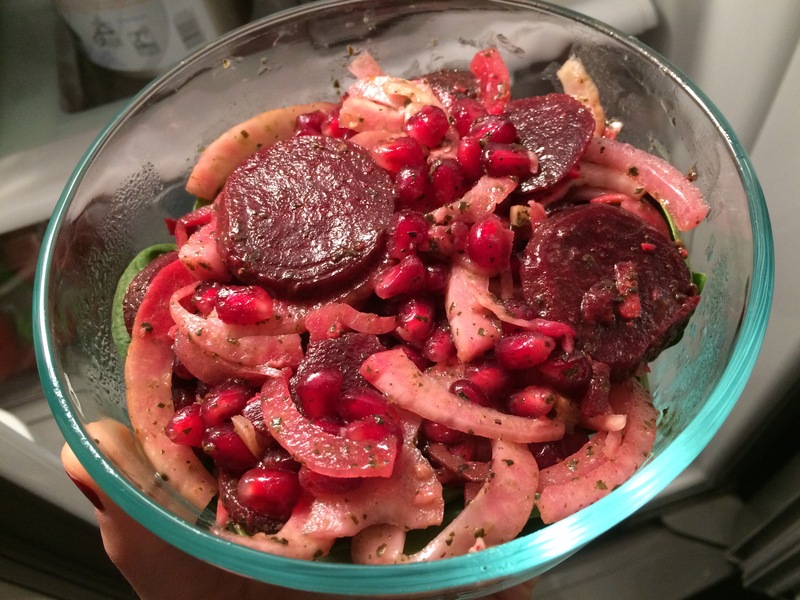 Slice beets and mix with greens, pomegranate arils, fennel and onion slices. Process dressing ingredients in a blender until pale green. Drizzle dressing over salad and top with cheese. I’ve made some great salads lately, and thought I’d share them with you. I whipped up the Hot Winter Salad with Kale one night and served it with roasted chicken. Excellent flavor! Even Andrew liked it, and he’s not a fan of beans. Or avocado. Or kale, really. I loved that it was hot, and the sweetness of the beans and red pepper really stood out. I also made her Ruby Red Salad and packed two portions in containers to bring with me for lunches this week. I like beets and had some in the fridge, and I also love fennel, and it’s the perfect time for pomegranate. Clearly, I had to make this recipe. Another huge winner! It calls for a homemade dressing that features basil, but you could really use just about anything on this. I loved the sweetness of the pomegranate arils, the crunchy fennel and herby dressing. So good! I’m ONE DAY away from the end of my first rotation this semester, and I couldn’t be more excited. One down, two to go!